One man even got angry with me that I wouldn’t turn my scope and attention away from a Lincoln’s sparrow I was filming to look at the bald eagle a mile away behind me. I told him that I’d already seen eagle, he apparently needed physical evidence of my eagle viewing ability. As I said, eagles are cool, but sometimes I just want to watch something else. As I watched the eagles over St. Paul, I took moment to remember how rare eagles were when I was a kid in the 1970s and 80s. The only eagles I ever saw were in books and magazines. From what I read, if I was lucky, I might grow up and travel to the Alaskan wilderness and see eagles soaring over the rugged and mountainous terrain. It never occurred to me that eagles would be part of my usual rush hour commute in the city one day. I realized that if someone like me who grew up without eagles turned into a nonchalant adult about them and even on occasion refer to them as “sky carp” what will kids who grow up with them think when they’re my age? I grew up with all kinds of laws that were not only supposed to protect the wildlife and public lands we love, but also to correct some of the mistakes of our nation’s past like shooting the passenger pigeon to oblivion and reintroducing the bald eagle. 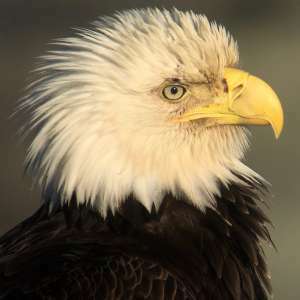 I grew up with the Endangered Species Act, the Migratory Bird Treaty Act and the Bald and Golden Eagle Act . EAGLE DIGISCOPED WITH SWARVOSKI ATX 65MM SCOPE AND PHONESKOPE CASE AND IPHONE 7. This year the Migratory Bird Treaty Act turns 100 years old. The Act essentially says that you can’t have non game bird parts in your possession without the proper permits. If you do have the permits whatever bird parts you collect needs to be for research or eduction, you still can’t use it to sell cardinal feathers earrings or make a dress out of blue jay feathers. As part of the 100 year anniversary Cornell Lab of Ornithology, the National Audubon Society and National Geographic and Birdlife International are calling 2018 the Year of the Bird. Some people like me look at that and think, “Dude, every day is Year of the Bird to me.” But I’m taking it as an idea to tell people why birds matter to me and get out and enjoy these birds as much possible. I’m also using it as an excuse when my choice is to go birding or do laundry: birding it is! I haven’t been to Sax Zim Bog in a few years to look for owls. Hopefully that will be corrected by the time this is published. I’m going to book some time in either a Greater Prairie Chicken Blind or Sharp-tailed Grouse Blind (or both). I’m going to take the time to visit Golden-winged Warbler breeding spots and get better photos. I’m going to keep an album on Flickr of bird pictures to see how many different species I can photograph! I’m going to work the heck out of my PhoneSkope case. And I’m going to try and find my nemesis bird: the Spruce Grouse. I’m also going to keep an album on Flickr to see how many species I can digiscope this year.